Robert Baden-Powell didn’t have a dead car battery in mind when he wrote that ubiquitous motto well over a hundred years ago – but he’d certainly agree that a dead battery can wreck your day. While most of us “car guys” are usually equipped with a set of jumper cables, they don’t do you a bit of good if you’re on a lone country road or in a strange neighborhood in the middle of the night. Even jump-starting your car off another car can be risky, especially on a busy highway or in inclement weather. Calling for a tow truck is a good way to drop $100 or more, and who wants to sit around waiting for an hour? No, if Baden-Powell were around today, he’d be impressed with modern lithium ion battery tech, and he’d be carrying one of those pocket-sized devices capable of jump-starting a car. The NICOclub Headquarters is the ideal location to make good use of one of these – Why? We have a collection of obstinate old Datsuns that don’t always get driven a lot, so their batteries discharge over time. We’ve got teenagers who tend to leave lights on, dome lights on, or a door open – usually right after I’ve paid way too much for a new battery. On road trips and event weekends, we burn a lot of battery life (phones, tablets, laptops) to keep the business rolling. I’m often asked to do some under-hood diagnosis – so the bright flashlight (and the ability to jump a dead battery) is helpful. One, most all of these jump starters are manufactured in a very small area of China. The Chinese are the kings of miniaturization, and their competition for market share means they’re continually adding more and more features to their pocket-sized electronics. Two, there are literally THOUSANDS of these units on the market priced from $75 to over $200. However, like other products, most are re-branded for marketing purposes. For example, the unit I selected is also re-branded by a well-known tool manufacturer (who slaps on a hefty $120 markup just for their name). Three, this thing packs a punch – It will jump-start a diesel pickup TWELVE times on a single charge, a full charge will provide between 15 and 40 jump starts, the flashlight (and emergency strobe light) is a beast, and it powered my Galaxy Note IV from dead to 22% in 11 minutes! I knew these would be a hit with the NICOclub community – especially at a price lower than in the stores! Through some of my contacts, I found a company to supply these units, and we’re passing the savings (and convenience) along to you. 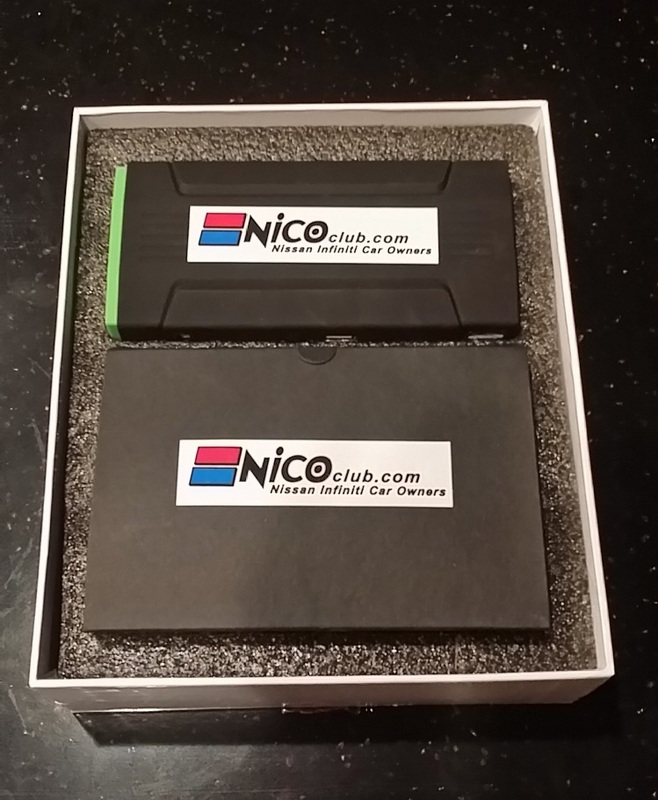 Now you can represent (and support) NICOclub while you’re helping a stranded motorist! We’re able to get these out to you guys for a BETTER price than you’ll find online (even Amazon), but at $70 SHIPPED, they won’t be around forever. Grab one for yourself and one for your significant other – That’s cheaper than a new battery, cheaper than a tow truck bill, and cheaper than a couple good sets of jumper cables. We’ve made the process simple and painless – Just click the link below, make sure you include your shipping address, and we’ll get one (or more) headed your way. 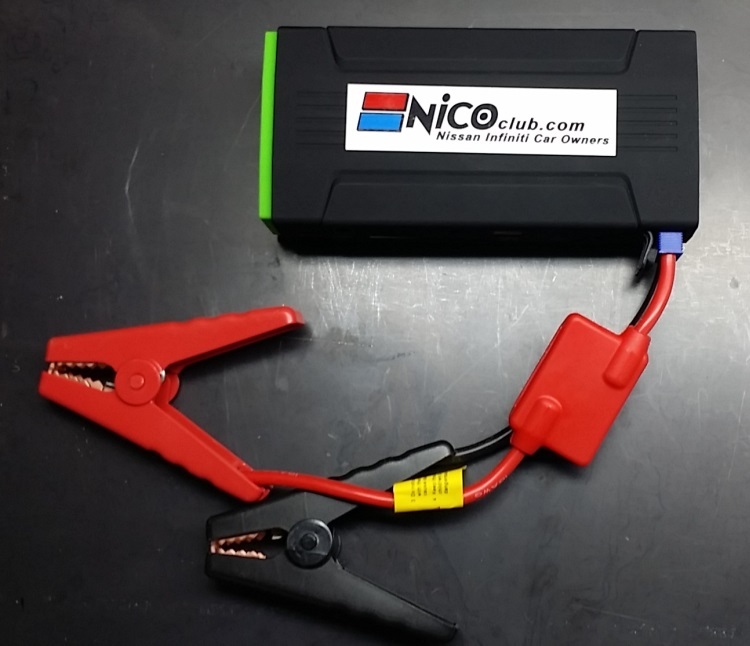 Order a NICOclub.com Portable Jump Starter right now! Dimensions: 6.2″ long x 2.9″ wide x 1.1″ thick. Protection Features: Over-current protection to avoid circuit damage, short circuit protection to avoid damage to the power supply, overload protection to protect its own battery, over-voltage protection to auto-stabilize the output voltage to avoid damage to the connected device in cases of abnormal voltage, and over-charge protection (auto shut off) to prevent damage to electronic devices.